Ribbon is cut on the George Reid House! 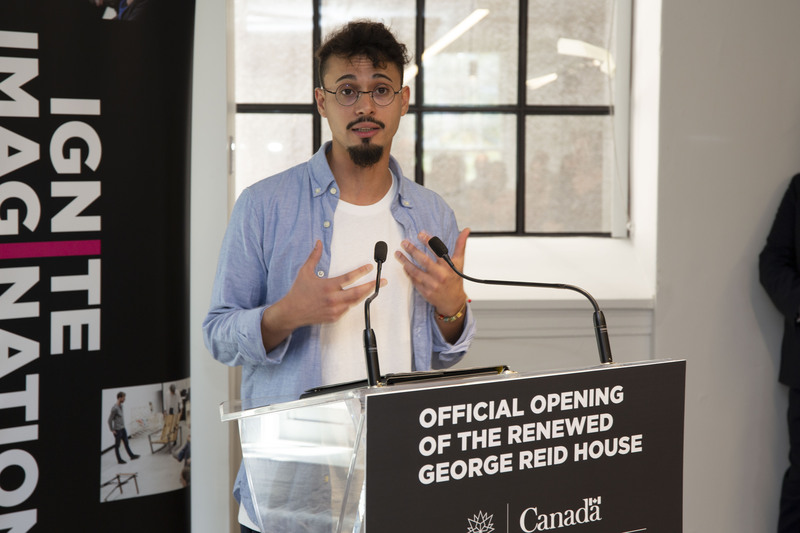 OCAD University’s historic George Reid House has officially re-opened following a dynamic renovation of the building, including the addition of Indigenous artwork created by Inuk artist Couzyn van Heuvelen. 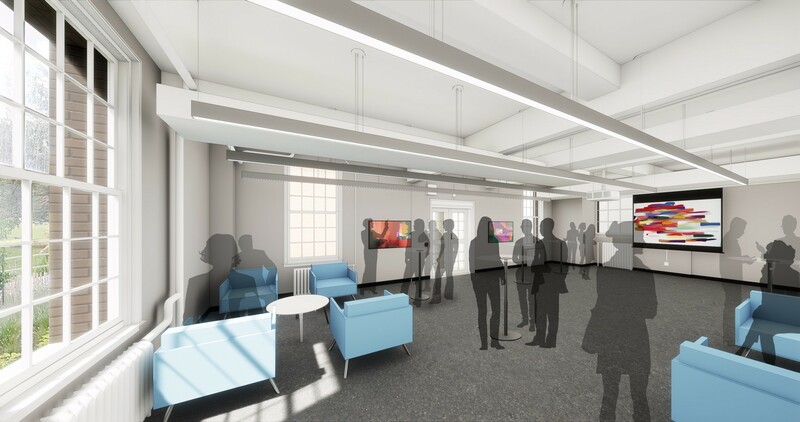 The building’s refurbishment – as part of OCAD University’s larger, Creative City Campus revitalization project ̶ includes the modernization of interior facilities, the creation of new event, meeting and program spaces, and the development of an enhanced circulation space with display opportunities. 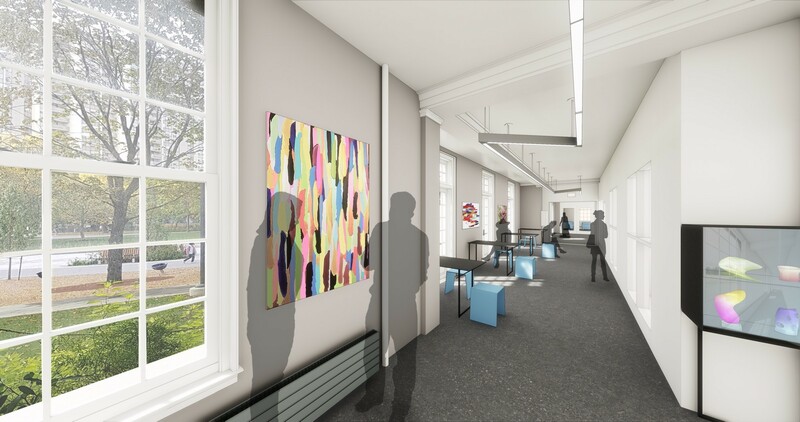 OCAD University commissioned van Heuvelen to create permanent artwork following a call to Indigenous artists and designers to submit proposals for artwork to be permanently installed in the refurbished building. Longlisted this year for the Sobey Art Award, van Heuvelen was born in Iqaluit, Nunavut, and now lives in southern Ontario. His work explores Inuit culture and identity, new and old technologies, and personal narratives. The renovation project is part of the Creative City Campus capital initiative and is funded by the Government of Ontario (through the Ministry Training, Colleges and Universities) and the Government of Canada through the Canada 150 Community Infrastructure Program (through the Federal Development Agency for Southern Ontario). Read more about Ribbon is cut on the George Reid House! LandMarks2017/Repères2017 was a Canada 150 Signature Project of large-scale, participation-oriented art and activities of national scope. OCAD U was a founding partner of the project and was among 16 universities that took part. To commemorate the project, Partners in Art (PIA) has collaborated with Magenta Publishing to create a limited-edition book for members, sponsors, and participating artists that may also be accessed online. LandMarks2017/Repères2017: The Book includes work by faculty and students across Canada alongside the work of 12 artists and several essays. Dr. Vladimir Spicanovic, Dean of OCAD U’s Faculty of Art, contributed an essay titled Pedagogies of the Land. Funded by the Government of Canada in partnership with PIA, Landmarks 2017 invited Canadians to creatively explore and deepen their connection to the land through a series of contemporary art projects across the country in national parks and historic sites. In the winter 2017 semester, Min Sook Lee and Laura Millard led a cross-disciplinary course that resulted in an exhibition for the project at Rouge Beach. Students engaged with diverse issues including concepts of nature, post-colonial issues of nationhood and narratives of identity, community and citizenship. 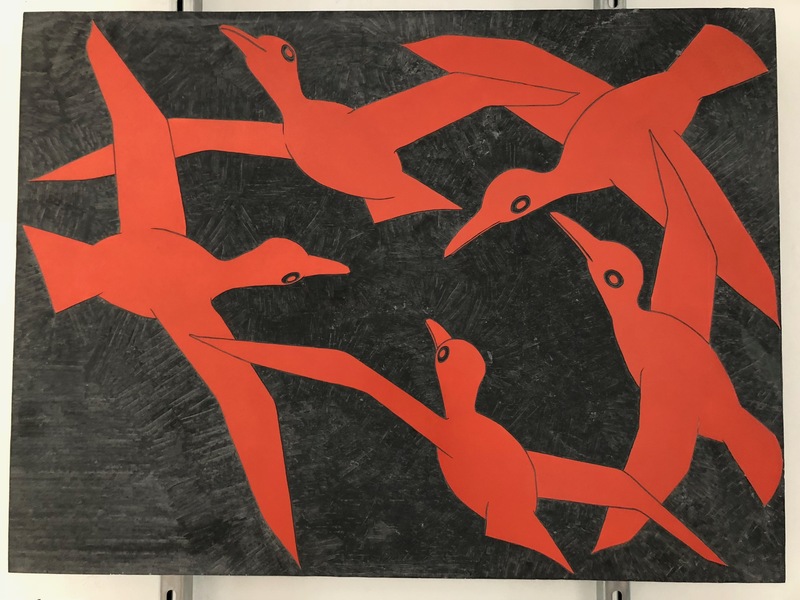 This past December, the Consulate General of Canada hosted a group exhibition in Dubai’s foremost arts hub, Alserkal Avenue, as part of the Canada 150 program. 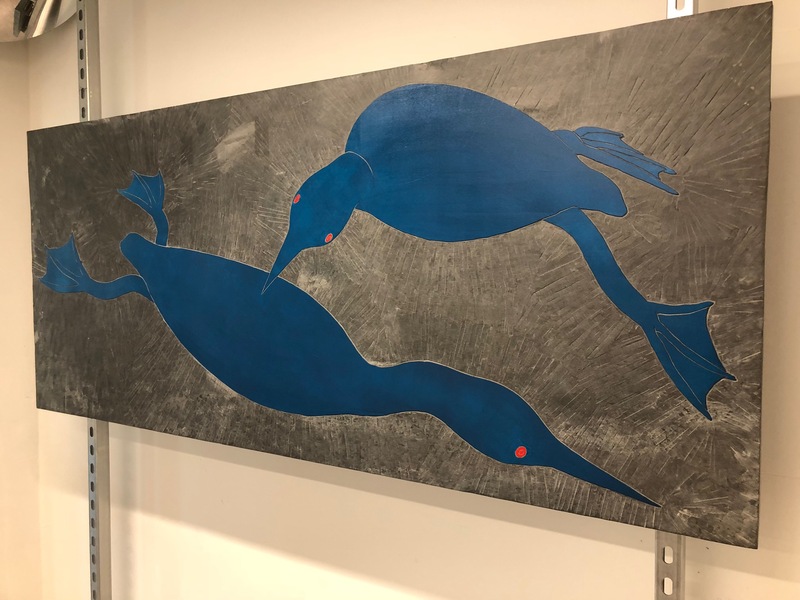 The exhibition included works by OCAD U alumni, Sara Pearson and Camille Jodoin-Eng, as well as Canadian artists, Arwa Abouon, KC Adams, Babak Golkar. The four OCAD U alumni works on display represented a range of recent innovative work coming out of the Drawing & Painting program in the Faculty of Art at OCAD U. A guided tour of the exhibit was provided by KC Adams on Dec 15, 2017. The exhibited works are courtesy of Art Works Consulting and were curated by Devan Patel. OCAD U’s participation was made possible through the university’s Government Relations & Partnerships and the Centre for Emerging Artists & Designers. A new book by author Paulina Cameron celebrates Canadian leaders, champions, and luminaries who are exemplary in their fields. Canada 150 Women showcases prominent women from a variety of professional sectors who demonstrate tenacity, diversity and strength. President Diamond is interviewed alongside former astronaut and current Governor General Julie Payette, filmmaker Deepa Mehta, Olympic medalist Silken Laumann and other acclaimed women. The featured women share their personal stories of how feminism has changed during their lifetimes, and they talk about their own visions for Canada. Go to CBC Radio to hear an interview with the author. The book is available at Chapters Indigo. LandMarks: Art + Places is a group exhibition created by OCAD University students at Rouge National Park. The exhibition is the result of a-cross disciplinary course bringing curator Tania Willard and artists Cheryl L'Hirondelle and Camille Turner in conversation with students to produce multidisciplinary site-specific works. In the form of limited-term on-site interventions at Rouge National Park, the artists’ works considers the political, economic and cultural implications of the stories we tell about ourselves through our relationships to land. These works reflect the very concept of nationhood by reconstructing narratives of identity that embrace indigeneity, engage with realities of colonialism and reimagine contemporary Canada. Participating artists: Abigail Permell, Cassandra Smyth, Debora Purcelli, Dimitra Roussakis, Kaiatanoron Bush, Lizz Khan, Natasha Hirt, Robin Love, Tia Cavanagh, Yawen Guo and Vishal Luthra. In the course, through readings, conversations with the artists and curator, site visits and ongoing discussions, students and faculty sought to problematize ideas of nationhood, concepts of nature, and explore intimate and public relationships to land. This course frames a critical context that marks a multi-faceted dialogue about land and the occasion of 150 years of Canada, pointing to futures and to much longer histories than 150 years of confederation. Dr. Vladimir Spicanovic, Dean, OCAD University Faculty of Art, is the Lead Advisor, Curriculum and Curatorial Engagement, for the LandMarks2017/ Repères2017 project. Free bus charter from OCAD University to Reception: Location, Bus leaves from OCAD University 100 McCaul St. at 10 a.m. and returns at 4 p.m.
Rouge Beach, Rouge National Park Free bus departs from OCAD University, 100 McCaul St. at 10 a.m.
Whose stories are we missing when we speak about land and freedom? It’s a profoundly important question for artists, Cheryl L’Hirondelle and Camille Turner, who share a keen interest in the mapping of public memory — our countless stories untold and songs unsung. Their Freedom Tours project for LandMarks 2017/Repères 2017 focuses on Ontario’s Thousand Islands National Park and Rouge National Urban Park. As the oldest park east of the Rockies, the Thousand Islands is rich in diverse, place-based narratives. The artists will host boat tours of the area that reimagine some of these histories in song. The Park comprises Akwesasne Mohawk lands and, given the proximity of the waters to America, borderlands — so the storytelling potential is vast. This dynamic artist pairing is inspired by concerns about freedom that drive both L’Hirondelle’s work with incarcerated women and song, and Turner’s enquiry into underrepresented histories of the black experience in Canada. On June 17 and June 18, hop on a free charter bus from OCAD University to the launch location of the Freedom Tours boat tour near Kingston, Ontario. Book your spot to on the bus and from the event here, then click here to get your free tickets for the boat tour. The charter bus departs at 11:30 a.m. sharp,and the cruise runs from 3 p.m. to 5. pm. The programme will include screenings of: Mobilize, Nimmikaage (She Dances for People), Etlinisigu’niet (Bleed Down) and Sisters & Brothers (2015).